WATERFRONT VIEW, FULL KITCHEN, POOL/HOT TUB, ROMANTIC, BALCONY, WIFI! 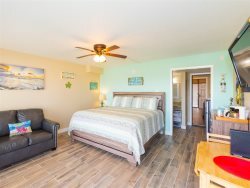 The Pelican Room is a beautifully decorated, cozy, 1 bedroom 1 bathroom condo located on the second floor of the newly remodeled Laguna Reef complex. There is a king size bed in the bedroom with plenty of space for your personal belongings’ dresser. Take in the breathtaking views of the gorgeous Aransas Bay while relaxing on the new living room furniture. There is also a flat screen television and a queen size sleeper sofa in the living room to comfortably sleep up to 4 people. Enjoy preparing your daily catch off the 1000 ft pier in the fully equipped kitchen the Pelican Room offers. Complete with all kitchen amenities, you will feel right at home! There is also free wifi at The Pelican Room. Guests will have access to the Hot Tub, swimming pool, grilling area, and fishing on the 1000 ft. pier, in the lagoon. Contact us about hiring you a private fishing guide, or do a sunset cruise to San Jose Island! Sit on the second floor patio in front of your room and enjoy the ocean view with a glass of wine. The Pelican Room is located near the Rockport Heritage District and Rockport Beach. Spend a day in the sun at the Rockport Beach where you can rent jet skis, swim with the kids, or grill up some food at one of the picnic areas. The Rockport Beach also allows fishing and is only five dollars for a day pass or 20 dollars for a year pass. There are two piers at the Rockport Beach, the south pier is free and the north pier has a beach admission fee. There is also a boat ramp. We have a list of fishing guides on our site as well. This is also a prime location for birding! Little Bay has many protected areas for birds that you can enjoy while walking along the water. Rockport is home to many historical sights and parks as well, including the Fulton Mansion, Goose Island State Park, and The Texas Maritime Museum. Never run out of things to do and places to see, plan your Rockport vacation today!